A conservative judge is appointed by the President to spearhead America’s escalating war against drugs, only to discover that his teenage daughter is an addict. BEFORE: This mini Michael Douglas chain wraps up today with the 2000 film, Traffic. 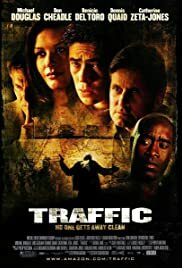 Nominated for five Academy Awards and winning four of them, Traffic was highly acclaimed by critics and viewers alike. An interesting piece of trivia from Wikipedia: Traffic was the first film in 25 years to take home all of the Oscars it was nominated for except Best Picture, the last film to do so being Jaws. AFTER: In Traffic, the most important thing is not the story. Sure, the story is always important and so are the characters. But what Steven Soderbergh really got across was the tone, and he did this by shooting in three very distinct styles. The three distinct styles come into play with the three different story lines, all of which take place in a different location. So not only do the styles help differentiate who is the focus of the scene, but where the scene is taking place. For a film with a bunch of interweaving stories and characters going all over the place, I found this to be a very helpful way to figure out what was going on at all times. To begin with, you have the Mexico storyline which focuses mainly on the cartels. Soderbergh gave the film a yellowish-tint and introduced a lot of grain into the picture. It makes the film feel like Mexico by having a grittier and humid look to it. For Judge Wakefield’s (Michael Douglas) story, Soderbergh used tungsten film which gives it a very blue (and I mean very blue as in black and white with blue substituting for the black) tint. A big focus of this storyline is Wakefield’s daughter Caroline (Erika Christensen) who is a heavy drug addict unbeknownst to her father and the blue tint adds to the feeling of a dream-like or high state. And the San Diego storyline, which focuses on a DEA investigation, looks what would be considered “normal”, or without any filters. It’s a bit shocking when you first see the film, but it by quickly becomes an integral part of the film. The story itself leaves something to be desired. It’s a compelling and interesting story. But the ending isn’t a great conclusion. While there are no loose ends, it feels like there are. It’s as if something is missing but you can’t quite put your finger on it. All-in-all, it’s an entertaining film with a unique take on how to keep track of multiple story lines.